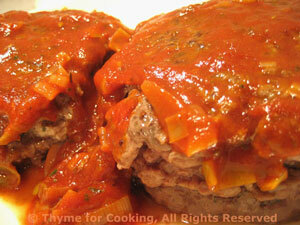 Beef Patties with Paprika Sauce, Thyme for Cooking quick and easy. We use 10oz and make 2 nice burgers. The Paprika Sauce is a bit more 'adult' than the usual ketchup. If you don't have tomato sauce, use 1/3 cup more chicken stock and 1 tbs more tomato paste. Mix breadcrumbs, mustard, Worcestershire, garlic powder and paprika. Add onion and sauté until starting to brown, about 8 minutes. Add patties (moving onions to the side, but leave in pan) and sauté 5 - 7 minutes per side. Add paprika and sauté 1 minute. Add tomato sauce, stock and vinegar, bring to a simmer, stirring up the browned bits. Stir in tomato paste, spoon over burgers and serve.